For at least 40,000 years, Australian Aborigines have lived in macadamia heartland. As hunters and gatherers, they had an intimate understanding of their environment. The wild macadamias usually grew in dense rainforests, with competition from other trees and absence of light resulting in their producing few nuts. However, trees growing at the edge of the rainforest or where the Aborigines had encouraged them by burning around each tree generally produced annual crops. In 1828, Alan Cunningham (explorer and botanist) was the first Western person to record the macadamia. Other names for Macadamia Nuts are Bush nut, Queensland nut, Queen of nuts, Macadamia, Bauple nut, Boombera, Jindilli and Gyndl. The Van Tassel plantings were at ʻUalakaʻa on a grassy hillside of former pasture land. Mo‘olelo (Hawaiian stories) indicate that Pu‘u ‘Ualaka‘a was a favored locality for sweet potato cultivation and King Kamehameha I established his personal sweet potato plantation here. ‘Pu‘u translates as “hill” and ‘ualaka‘a means “rolling sweet potato”, so named for the steepness of the terrain. (It’s above Makiki and also called Round Top.) Within the valley is a quarry where the basalt outcrop was chipped into pieces to make octopus lures. That is believed to be the origin of the word ‘makiki’ – a type of stone used for weights in octopus lures. Historical attempts at cultivation in the Makiki-Tantalus area included a coffee plantation by JM Herring along Moleka Stream in the late-1800s (valley conditions proved too wet for coffee beans to flourish) and Hawai‘i’s first commercial macadamia nut plantation along the west side of Pu‘u ‘Ualaka‘a. Nutridge was the name for Van Tassel’s home and grove. In 1925, Mr. Van Tassel commissioned architect Hart Wood to design his residence at Nutridge. Wood was at the forefront of the movement to create a style of architecture in Hawaii which would appropriately reflect a sense of place. One story high, the house is essentially devoid of ornate embellishment and follows an extremely original layout with the lanai (porch) serving in the capacity of a hallway, providing direct access to the bedrooms. Such an arrangement accentuates the sense of outdoor living. In order to stimulate interest in macadamia culture, beginning January 1, 1927, a Territorial law exempted properties in the Territory, used solely for the culture or production of macadamia nuts, from taxation for a period of 5 years. In its heyday, celebrities such as Clark Gable, Carlo Lombard, Frank Sinatra and Dina Merrill visited and stayed at the Nutridge House. The macadamia nut trees and the remnants of the historic flume system used to collect and transport the nuts remain on the slopes of ‘Ualakaʻa today. In 1981, the house was nominated and placed on the National Register of Historic Places and is part of the Hawaii State Park System, Pu‘u ‘Ualaka‘a State Wayside in Tantalus. For approximately 30-years, the historic house has been cared for and occupied under a permit by Rick Ralston, the founder and former owner of retail icon Crazy Shirts. Recently (2013,) DLNR issued a revocable permit to Discovering Hidden Hawaiʻi Tours, Inc for commercial events at the Nutridge property, including luaus (‘The Big Kahuna Luau’) and other similar events, tours and special, small scale events and non-profit and community use purposes. Tantalus is located in the Koʻolau mountain range in the Kona district of the island of O‘ahu. The ridges that carry Tantalus Drive and Round Top Drive surround Makiki Valley. Within this valley, three streams, Kānealole, Moleka and Maunalaha, eventually drain into Māmala Bay off of the Honolulu Plain. Early Hawaiians grew taro near the mouth of Makiki Valley where runoff from the three streams created ideal agricultural conditions. Archaeologists speculate that by the 1600s the lowland forests had been extensively harvested and that approximately eighty-percent of the land below 2,000-feet elevation was altered. ‘Round Top’ and ‘Sugar Loaf’ were also named by early Punahou students; these names appear on an 1873 ‘Map of Makiki Valley’ surveyed by William De Witt Alexander. Mo‘olelo (Hawaiian stories) indicate that Pu‘u ‘Ualaka‘a was a favored locality for sweet potato cultivation and King Kamehameha I established his personal sweet potato plantation here. ‘Pu‘u translates as “hill” and ‘ualaka‘a means “rolling sweet potato”, so named for the steepness of the terrain. Within the valley is a quarry where the basalt outcrop was chipped into pieces to make octopus lures. That is believed to be the origin of the word ‘makiki’ – a type of stone used for weights in octopus lures. Historical attempts at cultivation in the Makiki-Tantalus area included a coffee plantation by JM Herring along Moleka Stream in the late-1800s (valley conditions proved too wet for coffee beans to flourish) and Hawai‘i’s first commercial macadamia nut plantation along the west side of Pu‘u ‘Ualaka‘a. Rows of macadamia nuts trees from the original orchard remain today. Due to the close proximity to Honolulu Harbor, the Makiki-Tantalus forest underwent severe deforestation in two periods. In the first period, heavy timber was cut for the sandalwood trade with China from 1815 to 1826. In the second period, 1833 to 1860, wood was primarily harvested as fuel for the whaling trade to render whale blubber into oil. By the late-1800s most of Makiki was bare, denuded of trees. The native forest was gone. As early as 1846, the Kingdom of Hawai‘i was facing development pressure from the public regarding the Makiki-Tantalus watershed. The barren hillsides were heavily eroded and the quantity and quality of fresh water in the streams was compromised. That same year, King Kamehameha III passed a law declaring forests to be government property. In 1876, the Kingdom passed the “Act for the Protection and Preservation of Woods and Forests” including watershed preservation. In 1880, further legislation was enacted to protect all watershed areas that contributed domestic water supplies in the Makiki, Tantalus, Round Top and Pauoa area. Despite the establishment of the protected area, 1890s legislation allowed citizens to acquire residential property on Tantalus. The roadway climbs Tantalus Drive along the Kalāwahine ridge between Pauoa and Makiki Valleys and then descends along Round Top Drive on the ridge linking Pu‘u ‘Ōhi‘a (Mount Tantalus, 2,013-feet,) Pu‘u Kākea (Sugarloaf, 1,408-feet) and Pu‘u ‘Ualaka‘a (Round Top, 1,052-feet,) then past Maunalaha Valley Road to Makiki Street. 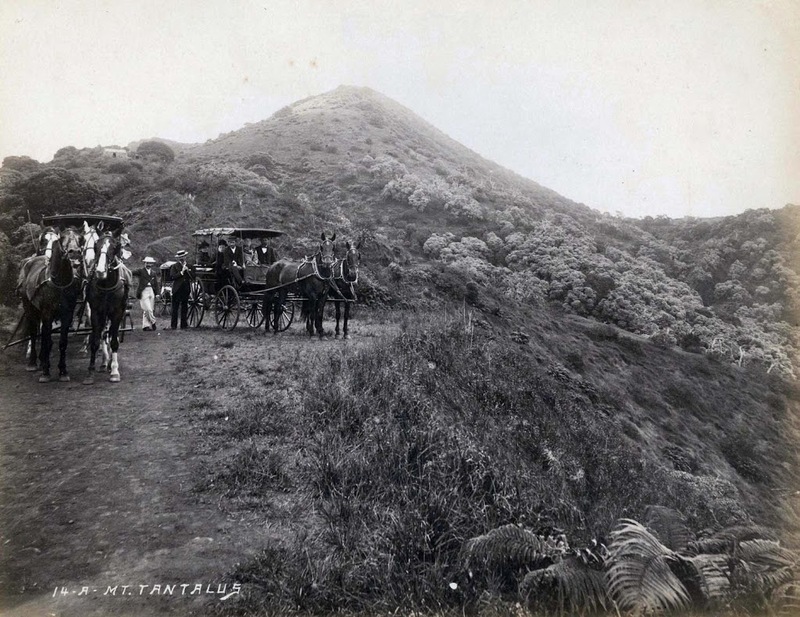 The image shows buggies on Tantalus in the 1900s. In addition, I have added other images in a folder of like kind in the Photos section on my Facebook and Google+ pages.